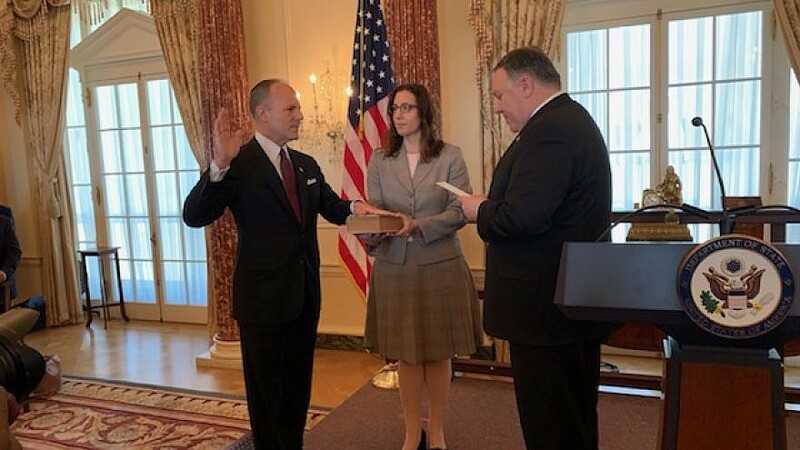 U.S. Special Envoy for Monitoring and Combating Anti-Semitism Elan Carr is sworn in (on a Hebrew Bible, or Tanach) by U.S. Secretary of State Mike Pompeo on April 11, 2019. Credit: Josh Katzen/JNS. “There is a greater rise in new anti-Semitism that clothes itself as anti-Zionism. The anti-Semitism of the European street, of the college campus and of those [who] have embraced the notion that the Jewish people don’t have a right to their homeland,” he said. (April 11, 2019 / JNS) Elan Carr was sworn in on Thursday as the U.S. Special Envoy for Monitoring and Combating Anti-Semitism. 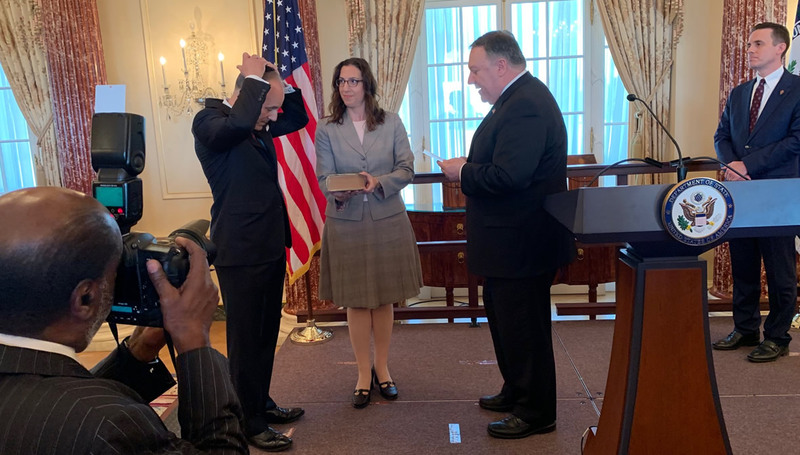 U.S. Secretary of State Mike Pompeo administered the oath of office to Carr, who placed one hand over a Hebrew Bible, or Tanach, that was held by his wife, Dahlia. The secretary remarked that the Iraq War veteran and attorney was chosen for “fierceness and vigor that he’ll bring to combating anti-Semitism,” according to a source at the event, which was closed to the press. Despite criticism, the Trump administration has made fighting anti-Semitism and BDS a priority. This comes amid a rise in anti-Semitic and anti-Israel vitriol and attacks nationwide, including the Oct. 27, 2018 shooting at the Tree of Life*Or L’Simcha Synagogue in Pittsburgh, as well as rhetoric being used by House Reps. Ilhan Omar (D-Minn.) and Rashida Tlaib (D-Mich.). Others in the Trump administration welcomed the swearing-in of Carr. “Welcome aboard to our U.S. Special Envoy for Monitoring and Combating anti-Semitism Elan Carr. Great to attend your swearing-in ceremony today—looking forward to continuing our collaboration on this crucial mission. I’m sure you will be a strong warrior for this critical cause!” tweeted U.S. special envoy for international negotiations Jason Greenblatt. U.S. Special Envoy for Monitoring and Combating Anti-Semitism Elan Carr puts on a yarmulke before being sworn in (on a Hebrew Bible, or Tanach) by U.S. Secretary of State Mike Pompeo on April 11, 2019. Credit: Josh Katzen/JNS. Carr, 50, has been making his mark since being appointed in February, appearing at a number of annual forums from the Conference of Presidents of Major Jewish Organizations in Jerusalem to the American Israel Public Affairs Committee. “I will work to eradicate the attempted distinction between anti-Zionism and anti-Semitism. There is no distinction,” he told U.S. Jewish leaders gathered at Jerusalem’s Inbal Hotel as part of the annual Conference of Presidents summit in February. “There is a greater rise in new anti-Semitism that clothes itself as anti-Zionism. The anti-Semitism of the European street, of the college campus and of those [who] have embraced the notion that the Jewish people don’t have a right to their homeland,” said Carr. Carr grew up in New York and was educated at a Jewish day school, traveling to Israel annually. He has recognized the Alpha Epsilon Pi chapter at the University of California, Berkeley, for helping to shape his Jewish identity. After graduation, he earned a law degree from Northwestern University. Carr then practiced litigation at a prominent New York law firm and, in the 1990s, assisted in creating Israel’s initial public defender’s office. In Iraq, where he served until 2004, along with analyzing threats and recommending actions, Carr served as a judge advocate in the American military’s judicial system, prosecuting enemy combatants before Iraqi judges at the Central Criminal Court. After returning to America from Iraq, Carr served as a criminal gang prosecutor with the Los Angeles County Deputy District Attorney’s office. A Republican, he unsuccessfully ran for Congress in 2014 against Democratic Rep. Ted Lieu. Pompeo said at Thursday’s ceremony that Carr is the fourth person to hold the envoy role, which was vacant for 21 months under Trump.